International action-comedy star Jackie Chan is tailor-made for The Tuxedo, a roller coaster ride full of laughs and outrageous stunts. Jimmy Tong (Chan) is an ordinary cabbie-turned-chauffeur who slips into a 2 billion-dollar, super-spy suit and inadvertently becomes a dashing secret agent. 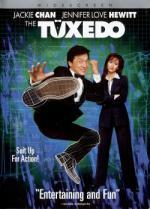 Fit for trouble, this deluxe tux unwittingly thrusts Chan and his dazzling partner Jennifer Love Hewitt into a dangerous world of international espionage. Slip into The Tuxedo for non-stop fun and action. I've seen this one a few times now. While it is definitely silly, I do find it entertaining. The plot is very simple and silly. It does seem to try to be poking fun at spy movies with some of what is going on. Clark, the man that Jimmy ends up working for is a secret agent who seems to be intended to be like Bond. Jimmy does bumble his way through things once he gets the tuxedo. That does make for some entertaining scenes. Martial arts turn up in some scenes. The fights do look good, though they aren't as impressive as what Chan has done in other movies. Some things that happen are slightly funny, but the movie really isn't that funny overall. I think more things were supposed to be funny. There is a villain who has a plan that is a bit bizarre. Really nothing that happens is believable or realistic, but it still manages to be entertaining. The characters are fine, though none of them are that interesting. Jackie Chan does well with his part. Jennifer Love Hewitt is ok, though her character has issues and doesn't work that well. I think it from the script and not her acting. This movie is silly, but it is sort of fun and entertaining. Fans of Jackie Chan might find something to like, though some of his fans won't care for it.